Ten-year-old Yazidu Sahabi may be the last of 18 children in his large family but he is his father’s favorite. Sahabi’s father, Abubakar Sahabi is very hopeful that his son will become the first doctor in the family because he reads better than most of his elder siblings. Sahabi, a primary three pupil of Nizzamiyya Islamiyya Model Primary School in Yabo local government of Nigeria’s Sokoto state, began to impress his father when he returned home with new Reading textbooks, and in the terms that followed, began to read fluently in Hausa and English languages. His father often watches proudly and listens to him recite rhymes, sing songs and tell stories from his textbooks to other children in the neighborhood. “When I watched him read I realized that the many hours he spent in school were worth the while. My decision to educate him is a good investment,” says Abubakar, who is a retired teacher. How did Sahabi get there? Last year, an early grade reading program called “Let’s Read! Mu Karanta!” was introduced by the USAID-funded Northern Education Initiative Plus project in schools in Northern Nigeria’s Bauchi and Sokoto states. 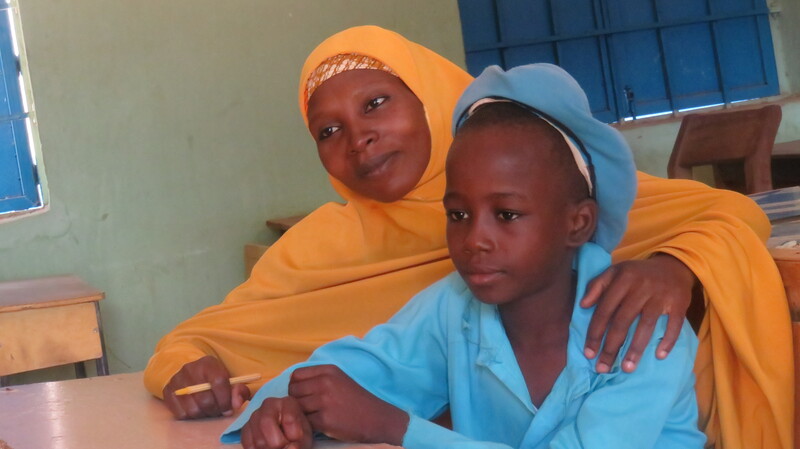 Sahabi was one of 668,297 children in first to third grades to begin improving their reading skills. Reading has been a major challenge for schools in Northern Nigeria. Eighty percent of children in second and third grades in Bauchi and Sokoto states were not able to read a single word in Hausa or English according to an Early Grade Reading Assessment baseline conducted by the project in 2016. Through the project, 9,240 teachers were equipped with practical skills to teach an early grade reading curriculum that enables children read with understanding in both Hausa and English languages by the end of third grade. The curriculum developed by more than 100 international and local specialists has 30 individual books including teacher guides and student books with 750 lessons. Lessons contain illustrations and stories that communicate local cultural norms and values but also encourage children to think critically. For Sahabi, it was a new experience which he embraced wholeheartedly. Zahrau Yabo is Sabi’s teacher. She also attended the same primary school as a little child and became a teacher to inspire other young girls. But it has not been a rosy journey. In her nine-year career as a teacher, she had not received any in-service training. She also struggled with the lack of teaching and learning materials and limited guidance and support for planning lessons. Until her Let’s Read! Mu Karanta! training on early grade reading, Yabo would enter a classroom and teach her pupils for several hours without inviting them to actively participate in lessons. She could hardly judge whether they were comprehending or not. “The trainings changed my whole perspective to teaching. I have teacher guides with properly structured lessons. I engage my pupils throughout the lesson. I hear their voices as much as they hear mine. It is team work,” Yabo says. She also says that the stories in the Let’s Read! Mu Karanta! textbooks have improved the behavior of children. “Children have listened to and read the stories that teach good hygiene so children now take their bath and wear neat uniforms to school. There are stories that teach good morals and the value of education so children now understand that daily attendance in school is important,” she says. With USAID support, the Northern Education Initiative Plus in two years has already distributed 1,936,939 Reading textbooks to pupils and teachers in Bauchi and Sokoto states. The early grade reading program provides opportunities for more children in Northern Nigeria to improve their basic literacy skills and help set them on a course for better life outcomes.